What is the value of a good fish guy? Well, to the average person who does not keep a pond or aquarium a good fish guy is not worth much at all, but, if you are a person who is getting into fish keeping or one who already has been hooked full on by the fish keeping bug a good fish guy is worth a whole lot. The practice of fish keeping is still loaded with all types of housewives tales and traditional information as to how fish should be kept, and unfortunately much of the info floating around out there is not exactly accurate and it only becomes compounded by one’s impulse to “research” on the internet where getting a straight answer for even the most common place issue can be a huge challenge. Now “the fish guy” becomes a little more valuable in your world. A very unseasonable cold October day today. None of the rain that they called for in the morning hours, but that should be hitting tonight. Today’s pond agenda consisted of starting the day with pond winterization services. 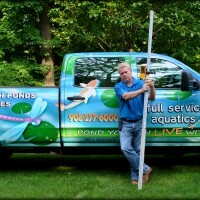 First pond winterizing was in Cranford, NJ on a new pond renovation service we had done about 1 month ago. The pond water was very clear and clean looking and just the first hints of pond algae was starting to appear on the submerged and waterfall rockwork. The waterfall looked great; very peaceful, and smoothly flowing. The koi and shubunkins were taking advantage of the fish caves we built into this pond but I did get a look at them and they all look great and seemed to have possibly grown a bit. For the service we cut back the hardy aquatic plants; pickerel, lilies, sweetflag, lizard tail, and iris. When I first got involved with ponds I don’t think I fully realized how encompassing the subject of ponds, watergardens, and waterfalls is. 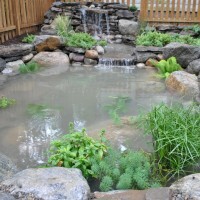 For me personally; ponds have actually become central to how I live my life and spend my days whether it be for business, recreation, or family time. The influence that ponds have over my psyche is pretty dominating. 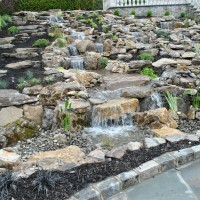 Being aware of this fact about myself, it only was natural for me to start to look outside of my experiences with ponds, waterfalls, water gardens, koi ponds, and water features in general, and to look further as to how it affects others regardless of if it is their first experience with a pond or they have many decades of experience with ponds; I look at what type of reaction it creates in people with the same interest. 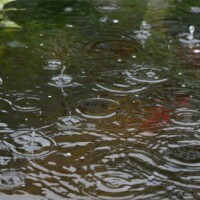 Welcome to the LOVE YOUR POND blog. Start date 9/09. I hope you will find this blog entertaining, informative, and worthy of your time reading it. 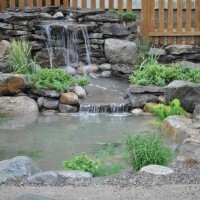 The blog is dedicated to all things aquatic, and we will discuss topics that will range from water gardening to fish breeding, aquarium keeping to filtration systems, the backyard pond to public botanical gardens, water conservation to rainbarrels. As this blog develops it will become a wealth of information for the reader and we encourage your feedback on all topics too, together we can make this something great! My goal will be to keep this blog updated often, and topical; your feedback will keep this author on his fingertips and create the outlet for more topics to be developed and discussed here. This blog will not only cover the success and sunny side of all things aquatic, it will delve into the difficulties of this passion and the realities of this passion which are not always easy topics when writing about a passion.